In mid-December, the Los Angeles City Council authorized a contract with Bollorè Group subsidiary, BlueCalifornia, for the first-ever electric carsharing pilot in L.A. The pilot will introduce electric carsharing fleets (100 electric cars and 200 charging stations) into disadvantaged neighborhoods in Central LA — Downtown L.A., Westlake, and parts of Koreatown. BlueCalifornia is supported by $1.67 million in grant funds from the California Air Resources Board and $1.82 million in electric vehicle infrastructure rebates, fee waivers, and in-kind support from the City. The pilot aims to increase the number of carsharing users, reduce the need for a private vehicle, and reduce CO2 emissions. 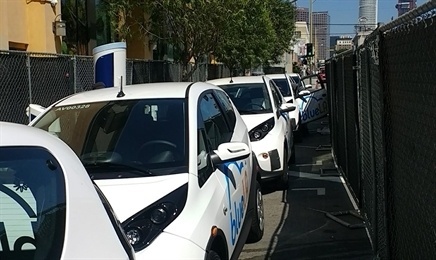 One June 9, 2017, Los Angeles officials cut the ribbon on a 5-car demonstration site as part of the kick-off for BlueLA, a first-of-its-kind pilot program designed to reduce greenhouse gas emissions by introducing electric carsharing fleets into disadvantaged communities. For background information and the recent ribbon cutting see the links below, from the Shared-Use Mobility Center.